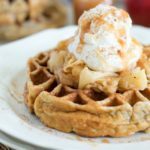 Tart apples are tossed with homemade caramel sauce and topped with a mix of flour, oats, walnuts, and cinnamon for a delicious make ahead Thanksgiving dessert. 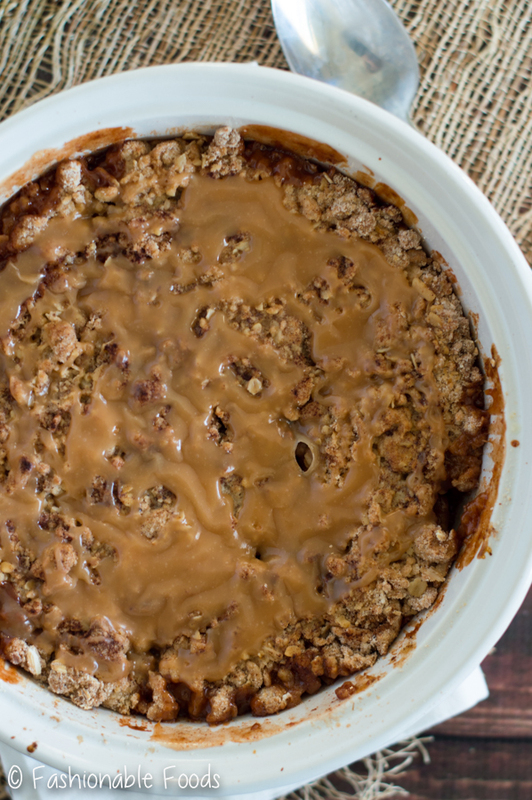 This caramel apple crisp is stress free and sure to please! Happy Thanksgiving week, friends! 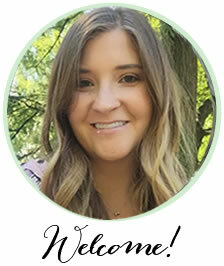 Do you have your menu planned? Or, if you’re not hosting are you making something to bring to the table? I don’t host Thanksgiving, but I always make the turkey and a few sides… and usually a dessert, too! If you need an easy (and make-ahead) dessert, I’ve got you covered with this caramel apple crisp. 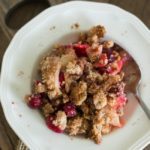 I may have said this before, but fruit crisps/cobbler are some of my favorite desserts. There’s something about warm fruit and crispy topping that always appeals to me. Plus, these types of desserts, in my opinion, require ice cream on top. And I love me some ice cream. 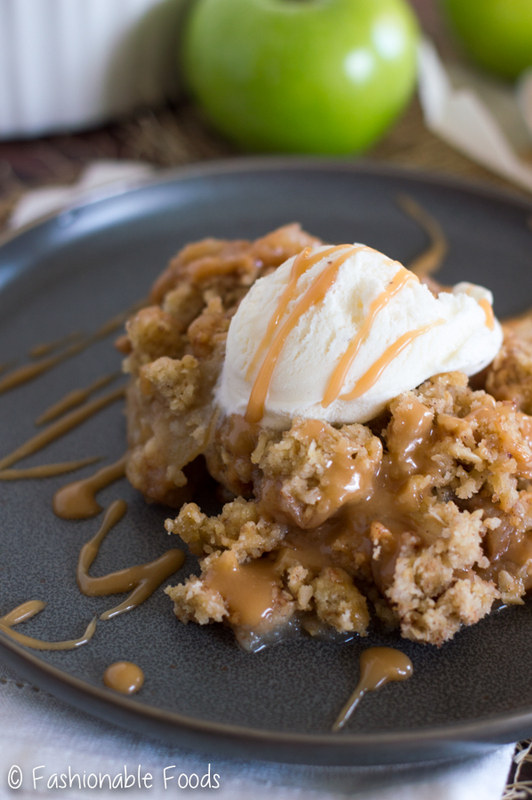 However, the best part of this caramel apple crisp (besides the caramel!) is that it can be made completely ahead! We all need some make-ahead desserts in our life during the holiday season, right? If you haven’t figured it out by now, caramel sauce is an obsession of mine. If I can work it into a dessert, I will. And as I say in every recipe that includes caramel, you can use store-bought… but I don’t recommend it. Why you ask? Simply because homemade is easy once you get the hang of it and while this may be a bit food snobby of me, it’s just better. Just because you can buy a convenience product, doesn’t mean you should. In all seriousness, store-bought caramel lacks the depth of flavor that homemade has. Most of them use high fructose corn syrup and other unnecessary ingredients. All you need is sugar, water, and heavy cream. I also like to add a little butter for extra richness, but you don’t have to. And at the end of the day, if you want to use store-bought caramel I’m not going to know, so you do you! ? I like to use granny smith apples since they are tart and hold their shape well. Toss ’em with lemon juice and zest, cinnamon, a pinch of salt, and the caramel sauce. Pile the apple mixture into an 8×8 baking dish (or an 8-inch round baking dish) and then make the topping. We’ve got gluten-free flour (regular works too! 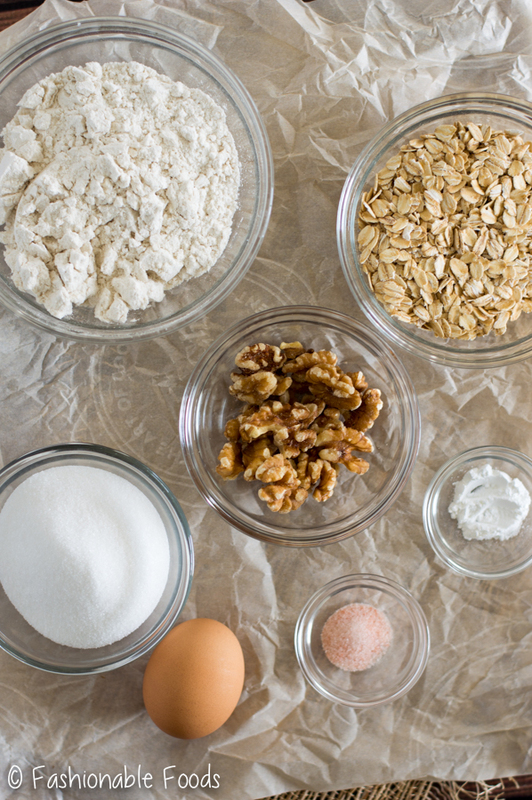 ), oats, walnuts, sugar, baking powder, salt, and an egg. Mix it all up until the dry ingredients are moistened, but the mixture is still crumbly. Sprinkle it over top of the apples and then drizzle everything with melted butter. Top with cinnamon and bake. Once it comes out of the oven, I like to pour caramel sauce over top and let it harden. However, you don’t have to add the caramel on top… you can just add additional caramel to each serving. To make this ahead, you’ll cool it completely and then refrigerate for up to 3 days. 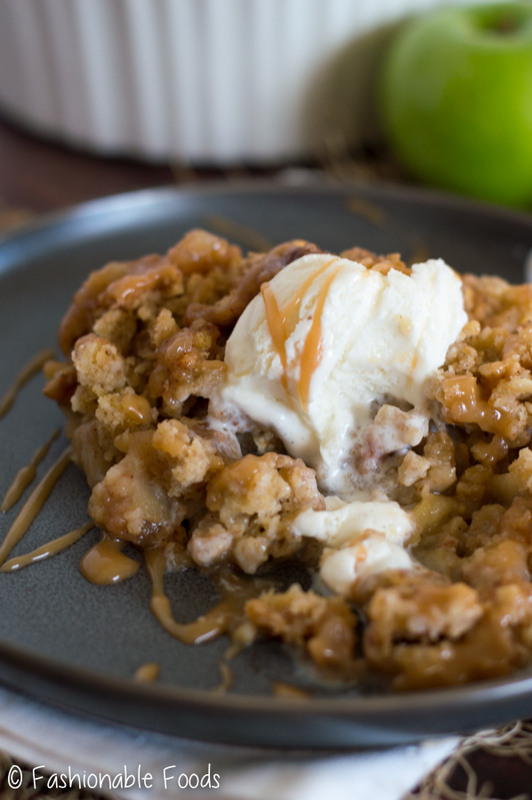 You can serve this caramel apple crisp cold, at room temperature, or warm. 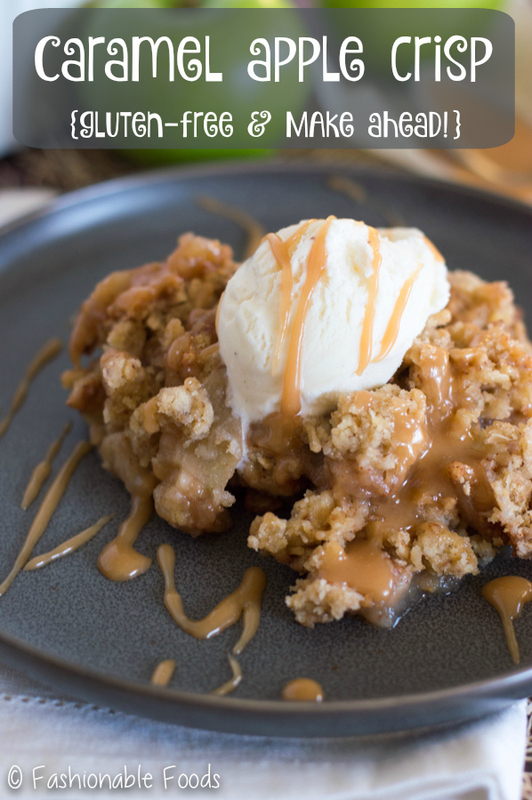 I like all of the above, but you can’t beat warm apple crisp with ice cream! ? I hope you all have a fantastic Thanksgiving and enjoy some good food! I’ll see you back here on Friday with a recipe to use up some leftovers! Combine the sugar and water in a medium saucepot over medium-high heat, stirring constantly until the sugar melts. Once the mixture is liquid, allow it to cook over medium heat until it is amber in color. Allow the amber color to deepen a bit and when it looks like the color of caramel, stir in the butter. Be careful, as the mixture will spatter. Once the butter is completely melted, remove the caramel from the heat and carefully stir in the heavy cream until the mixture is smooth. Set aside. 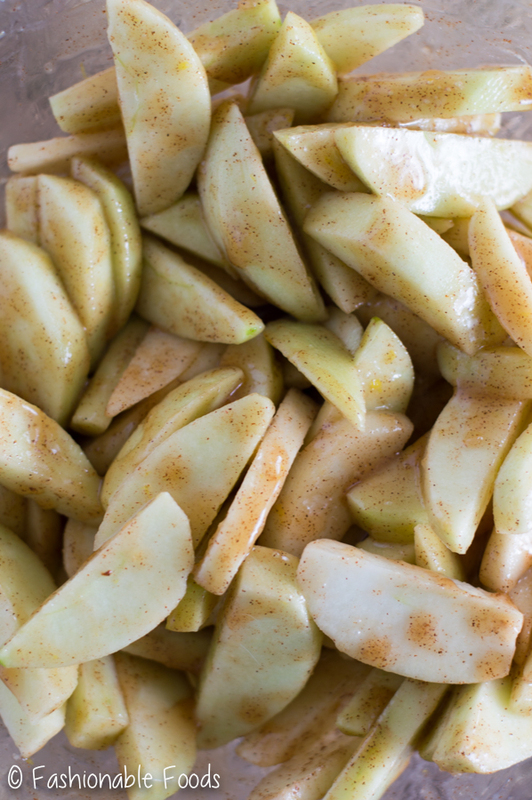 Combine the apples, lemon juice and zest, caramel sauce, cinnamon, and salt in a large bowl. Toss to combine. Transfer to a buttered 8x8-inch baking dish and set aside while you make the topping. In a mini food processor, pulse the oats with the walnuts until coarsely chopped. Combine in a bowl with the flour, sugar, baking powder, and salt. Mix well to combine. 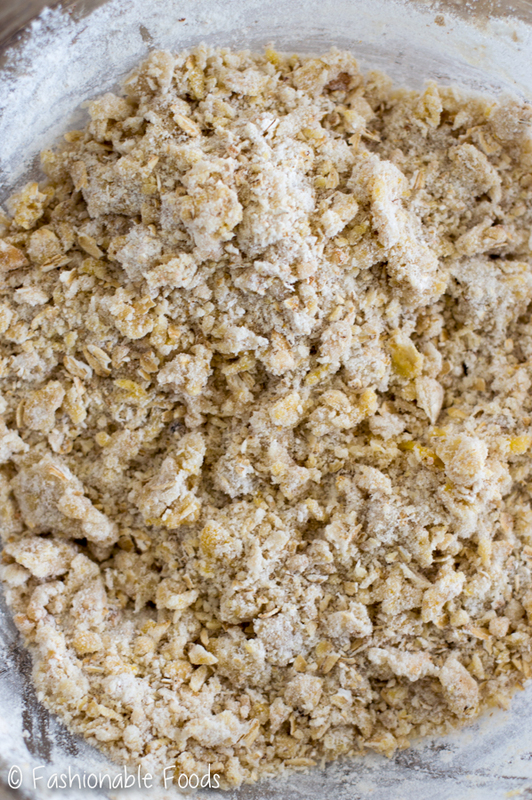 Stir in the beaten egg until the mixture resembles coarse crumbs. Sprinkle the mixture over the apples and pour the melted butter overtop. Sprinkle the top with cinnamon. Bake the apple crisp for 30-35 minutes, or until golden brown and then apples are tender. 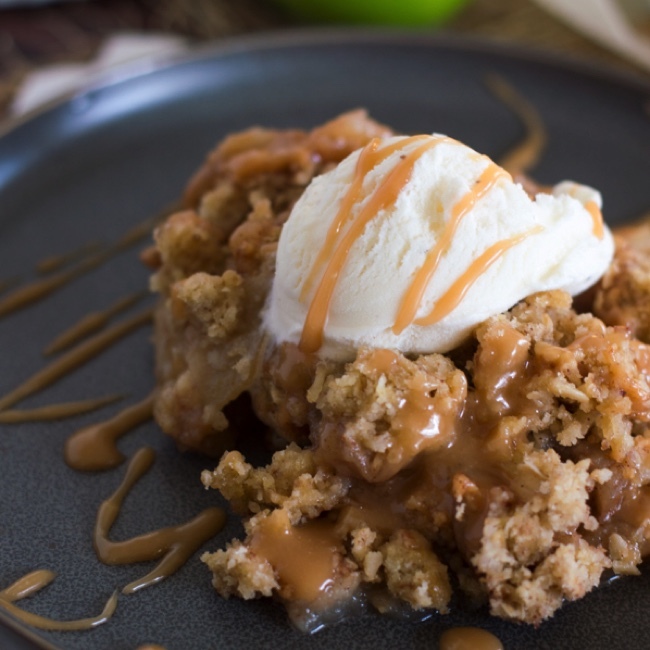 As soon as you take the apple crisp out of the oven, drizzle the top with caramel sauce. Allow the apple crisp to cool completely and then cover and refrigerate. You can make this up to 3 days ahead and serve it cold, at room temperature, or warm! 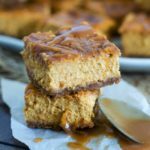 It’s delicious with ice cream or whipped cream for topping and additional caramel sauce, of course! *If you are gluten-free or making this for gluten-free guests, be sure your oats are certified gluten-free! Quaker oats are NOT gluten-free. Bob's Red Mill makes certified gluten-free oats! Looks delicious! I want to try one!